"Big, soft, Amish sugar cookies, called sugar 'cakes'." In a large bowl, cream together the shortening and 2 cups sugar until smooth. Stir in the eggs, one at a time, then the vanilla. Combine the flour, baking powder, baking soda, cream of tartar and salt; stir into the creamed mixture alternately with the buttermilk until well blended. Place big heaping tablespoonfuls onto prepared cookie sheets about 3 inches apart. Sprinkle each cookie with some of the remaining sugar. Bake for 10 to 12 minutes in the preheated oven, until edges begin to turn golden. Remove from baking sheets to cool on wire racks. When cool, store in an airtight container. 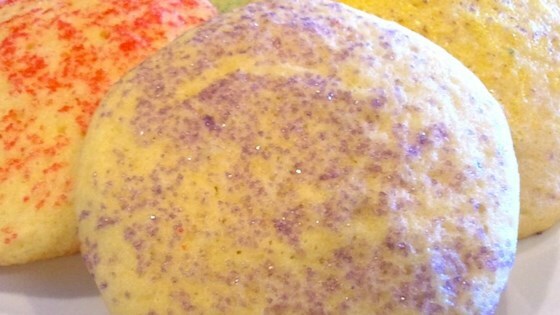 This really was the best sugar cookie recipe--ever! So very easy and quick. I was concerned over very soft and runny batter, but shouldn't have been,,,,,,,,, turned out perfect.